All the Alliance’s work aims to help governments implement the Trade Facilitation Agreement (TFA). The TFA Hub brings together everything you need to know in one place. 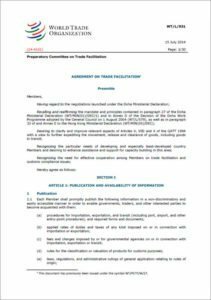 The Trade Facilitation Agreement (TFA) is a binding multilateral trade agreement between members of the World Trade Organization (WTO). The TFA was concluded in December 2013 and officially entered into force in February 2017. The agreement is designed to tackle the barriers to trade posed by burdensome border requirements. These barriers make it harder for businesses of all sizes to trade internationally but hurt small and medium-sized enterprises the most. By ratifying the agreement, countries commit to reducing red tape at borders – from measures to ensure quicker release and clearance of goods to better cooperation between border agencies. These reforms will increase transparency and efficiency, reduce bureaucracy and corruption and ultimately make trade simpler, faster and more cost-effective. Taken together, reforms have the potential to reduce trade costs by 14.3% on average and create around 20 million jobs, mostly in developing countries. The TFA is a unique opportunity to further development goals such as sustainable growth, poverty reduction and gender equality. 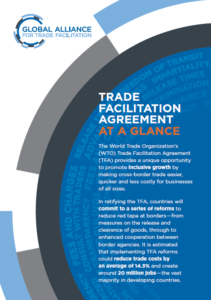 The WTO’s TFA Database is a tool to track and analyse WTO Members’ commitments under the TFA. Access the latest TFA data. 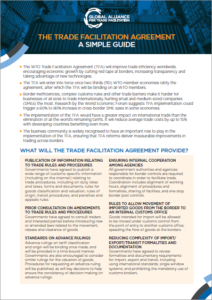 The Global Alliance for Trade Facilitation published this simple guide to the Trade Facilitation Agreement (TFA). The guide provides an overview of the main provisions in the TFA and what they mean for business. 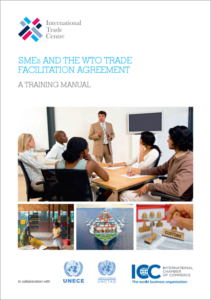 This guide for small and medium-sized enterprises (SMEs), published by the International Trade Centre, explains the Trade Facilitation Agreement’s (TFA) provisions and what they mean for businesses. 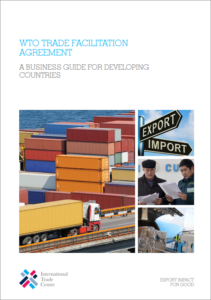 It also provides a practical guide for businesses on how they can benefit from the agreement. The Trade Facilitation Agreement (TFA) is a binding multilateral trade agreement between members of the World Trade Organization. The TFA was concluded in December 2013 and it officially entered into force in February 2017.